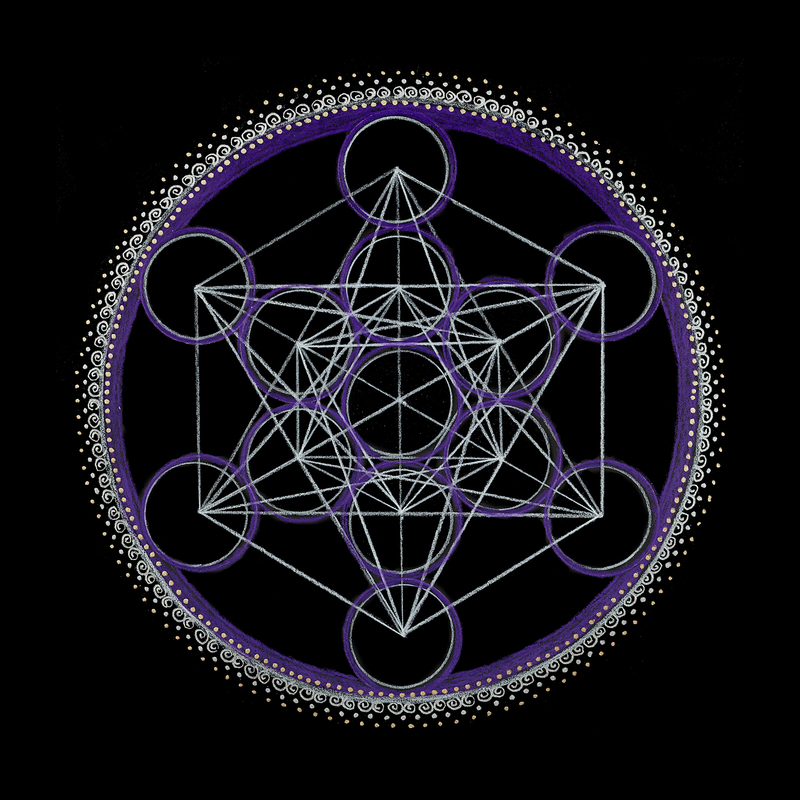 Metatron’s cube is a 3D matrix within a 2D symbol. This occurs by connecting the center points of the 13 circles in the Fruit of Life with 78 lines. Here the circular and linear worlds merge to reveal Metatron’s Cube, or the Knowledge of Life. In Hebrew, Metatron means metered throne or divine place. In Judaic literature, Metatron is seen as the prophet Enoch, who became the angelic scribe of the Book of Secrets for mankind’s return to the Garden of Eden. When Adam and Eve ate fruit from the Tree of Knowledge they were cast out of Eden and separated from knowing the Tree of Life. This mythical story in the book of Genesis, was written between 500-600 BCE, in response to Persia’s demand for a book of Jewish law. Judaism traces its roots to Abraham, the father of monotheism. He was blessed by the mythical Melchizedek, the King of Salem. Salem means whole and peaceful. Melchizedek is believed to be synonymous with Metatron and Enoch. Metatron’s cube is a reminder that all of these stories were created by humans to explain the meaning of life and that we ultimately hold the knowledge of life within us. The illusion of separation occurs when we stop seeing ourselves as souls within a human body. Metatron’s Cube also reveals the building blocks of life, the elements of nature known as the Platonic Solids. Message: Trust both your rational mind and your intuitive senses as you awaken to a new way of being. By looking at your present situation from all directions it will become clear what actions you need to take. Wisdom is awakening within your consciousness that will provide insights for your soul.